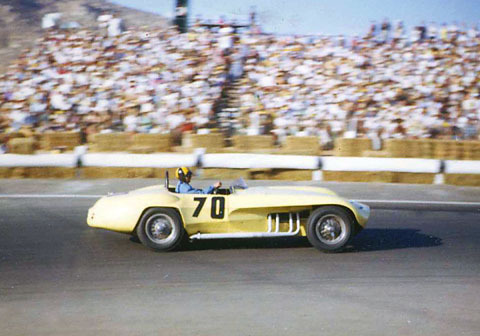 finished 5th in Old Yeller III at the "L.A. Times Grand Prix", held at Riverside October 15, 1961. This was a customer car that Balchowsky built for cinematographer Haskell Wexler. Drake rounds Riverside's Turn 6 during the 203 miles Grand Prix. Link to Bruce Jacobs driving Ol' Yaller Mk.III at the 2000 Monterey Historics. 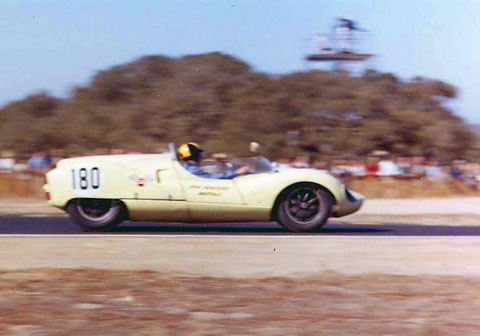 A week later at Laguna Seca, Drake drove George Grinzewitsch's 2 liter Cooper Monaco to 14th in the 1st heat, 17th in the 2nd heat.